WASHINGTON, D.C. – This week, as bankers from across the country descended on Washington to lobby Congress, the Alliance for Main Street Fairness (AMSF), an organization committed to championing issues important to small businesses, released its completed bracket for this year’s March Badness, the latest iteration of Wall Street’s attempt to fleece consumers and small businesses. 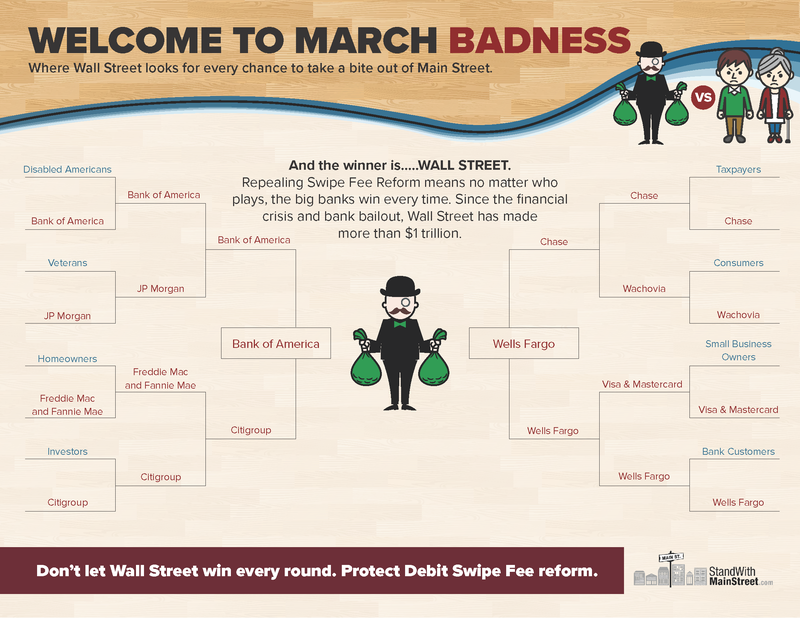 Unlike the NCAA tournament where every team has a fair shot, in this game, the banks always seem to win. This week the country’s biggest banks were leading the charge on Capitol Hill to roll back the reforms passed earlier this decade that protect retailers and restaurants from exorbitant fees. The big banks want to repeal swipe fee reforms and go back to overcharging main street businesses every time they accept a debit card. Before the adoption of swipe fee reform, Wall Street was charging small businesses whatever they liked on debit card purchases, with combined credit card and debit card swipe fees tripling over the previous decade to roughly $50 billion a year. The regulations put in place are the only thing preventing Wall Street from resuming the abusive practices. The Alliance for Main Street Fairness (AMSF) is an organization committed to championing issues important to small businesses. For more information or to arrange an interview, please contact info@standwithmainstreet.com.